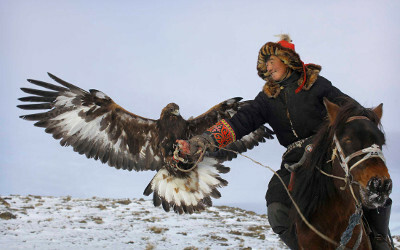 AKIPRESS.COM - Every October in Mongolia, among the high-altitude crags of the Altai Mountains, the ancient nomadic tradition of falconry comes to life. The area is home to the native burkitshi, who have trained eagles to aid in their hunting expeditions, according to Bloomberg. Jalsa Urubshurow, founder of Nomadic Expeditions and the Golden Eagle Festival, which runs from September 27 to October 5, offers seven-day guided immersions with a local family. Stay in yurts that come with hand-carved wooden beds warmed by wood-burning stoves. At night, pair a dinner of goat ribs or beshbarmak stew with Chinggis Khan vodka and wine. In the morning, steaming cups of spiced milk tea arrive with breakfast before you ride out on horseback with the hooded birds to look for the tracks of lynx, rabbits, or foxes. When you find them, your hunter releases his eagle, which flies 100 to 200 feet up before it circles, locates, then dives on the animal. They weigh 14 pounds and have a 7-foot wingspan. The force of their attack can take out an animal as large as a wolf. Getting there is an adventure in itself. From Ulaanbaatar, it’s a 3-hour flight west to Ulgii, then 2 to 5 more hours into the wilds.